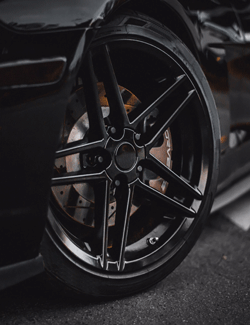 WILL NOT FIT: Vehicles equipped with upgraded or performance brakes such as Brembo, or specialty models with larger brake calipers including Cobra, Boss, GT500, Shelby etc. This bullit wheel and tire combination is a perfect fit for your 4th generation SN-95 Mustang. This staggered set of two 17x9 and two 17x10.5 black rims sports a machined lip and is guaranteed to fit stock Ford Mustangs from 1994-2004. The FR01 is an injection fed aluminum bullit rim, and is covered by a lifetime structural warranty. To further compliment your Mustang, these 17 inch wheels are wrapped with 245/45r17 front and 275/40r17 rear Toyo Proxes 4 Plus tires. The Proxes 4 Plus is an ultra-high performance all-season tire and a perfect match for high-horsepower sports cars. 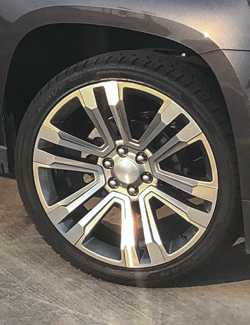 And this wheel-tire set includes free mounting and high-speed road force balancing using the latest Hunter equipment.